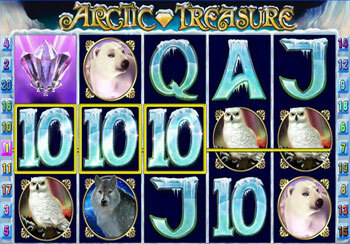 Arctic Treasure is a chillingly cool five-reel 20-payline video slot machine, brought to you by the technological boffins at Playtech. The game will leave you with chills, as it snowballs through time like a flurry of snow driving down the Alps. The graphics are quite stunning, offering a combination of jewels, arctic creatures, and the playing card denominations ten through ace on the icy reels. The game includes both wild and scatter symbols, thus giving you a greater chance of turning a profit. A Princess covered in all that is white acts as the wild symbol. This means that should she grace her presence on your screen, she will become a substitute for all other symbols, in order to ensure maximum chances to win. The crystal and canoe represent the scatter symbols, and they can land anywhere on the five reels in order to complete winning combinations, as long as more than two exist at any one time. 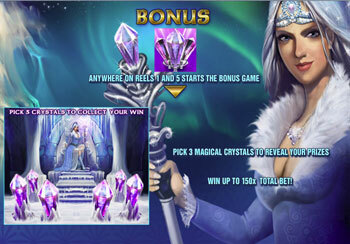 The snow-covered game also features a Free Spins Bonus Round, Special Bonus Feature, and a Gamble Feature. 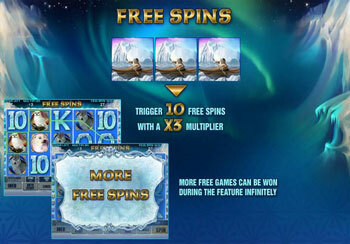 The Free Spins Bonus Round is activated when three or more canoe scatter symbols are found anywhere on the five reels, and the Special Bonus is activated when the crystal symbol appears anywhere on reels one and five simultaneously. When you have activated any win on Arctic Treasure, you can choose the special Gamble Feature. This feature is a classic hi-lo game, where you have to guess whether or not the turn of the next playing card is higher or lower than the last in order to double your money. 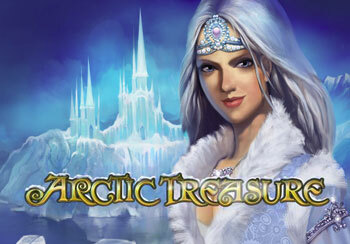 Arctic Treasure is a great game, but be careful it just may leave you feeling a little chilly.